If you need something bigger than an Equinox but not as massive as a Suburban, the 2008 Chevrolet TrailBlazer will probably fit well into your life (as well as your garage). It has good front- and rear-seat legroom, lots of headroom and a fair amount of cargo space. Looks terrible but still starts up and drives wherever you need it to go. This vehicle has had a rough life. I am not very easy on my vehicles. Mechanically the car is very sound. Has a brand new set of upper and lower ball joints, brand new set of brakes all the way around, new plugs and wires. As for the body it is pretty beat up, full of dents scrapes and scratches, the wheels are starting to oxidize pit. It has minimal rust around the lift gate. Some of its features include a fully operable did, aftermarket stereo, leather seats, heated front bucket seats, steering wheel controls, auto dimming rearview mirror, power heated side view mirrors, 2nd row radio, and has dual zone climate control. 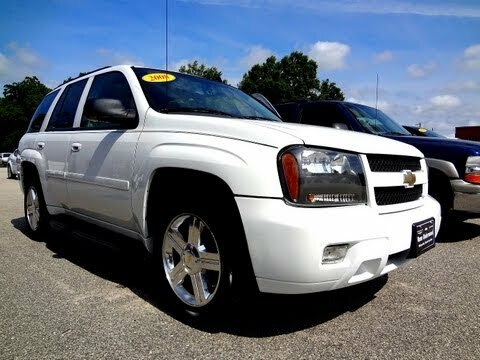 2008 Chevy trailblazer is a great vehicle! Not a single problem. I have had it for about 1 year. I have had the same vehicle before (it was an older model). It got flooded during hurricane Harvey. I bought a newer model and have enjoyed it ever since. It is like having my car back. It is very comfortable and roomy. It can carry 4 full grown adults. It is easy to get around in a big city. Since I got it I haven't had any problems with it. I make sure and get it maintained on a regular basis. The features include an auxiliary jack so I can plug in an Ipod without having to deal with CD’s anymore. I can rely on this vehicle to get me from point A to B. No problems with my SUV in the 4 years I have owned it. Only 75, 000 miles on it. My trailblazer is power everything, has good head room, is comfortable for long drives, has both dial speedometer and tachometer, has a very quiet engine, smooth ride and great acceleration, engine turns over immediately, has good mileage for a 4x4 (15-18 mpg). I love the moon roof that opens for light only and two ways for air. Other features I like are: cruise control, headlight dimmer and windshield wipers/washer all on the turn signal arm; rear window wiper/washer; roomy center console; and small storage compartments in cargo area.